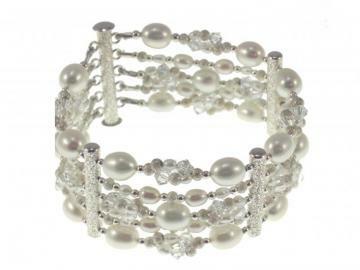 Hermione Harbuttt bracelets and cuffs are handmade from the finest components such as stunning Swarovski crystal and beautiful clusters of pearls. All of our jewellery is custom made, we can size to fit you, and can use a clasp type of your choosing. Rigid wide bracelet style accessories, usually from metal, are referred to as cuffs or cuff bracelets. 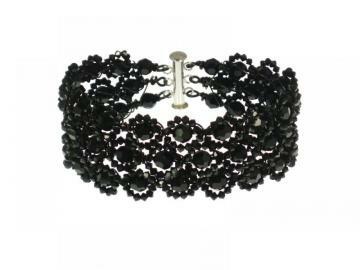 They usually have a clasp which differs them from a bangle. The clasp allows the wearer to fit the cuff over their hand and attach securely. Often made to measure these items often incorporate gemstones and high value metals and intricate detail. A charm bracelet carries personal charms: decorative pendants or trinkets which are signifiers of important things in the wearer’s life. The use of colored silicone rubber as a material for producing sports bracelets was popularised from 2003. Their success has led to the silicone bracelet becoming a high cost tool for various awareness, information, and charity campaigns. This can be likened to the use of awareness ribbons for similar purposes. These bracelets are also known as “baller id bands”, “baller bands” or “wristbands”. They can also be referred to as rubber wristbands, silicone wristbands or gel wristbands. During the 1987 U.S. Open, Chris Evert’s diamond line bracelet fell off onto the court. She stated about this, “I dropped my tennis bracelet”, and since then diamond line bracelets have been called tennis bracelets.